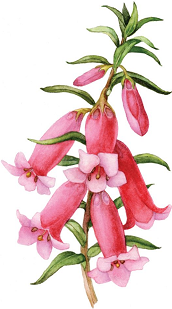 The 80th Grampians Wildflower Show will be over the last weekend of September – Saturday 29th from 9.30 am to 5pm and on Sunday 30th from 9.30am to 4pm. Please note the change in dates to the last weekend in September (a long weekend) rather than the first weekend in October. There will be regular guided walks through the Grampians Flora Botanic Garden, including an early morning bird walk on Sunday. We will also continue to sell our self-guided drive and walks guides and will run a couple of tag along “Orchids and other wildflowers” tours further afield. The entry charge will be $2, which covers the entry to the display and the garden walks. There is also a charge of $2 for the printed guides, and of $5 per head for the tag along tours.